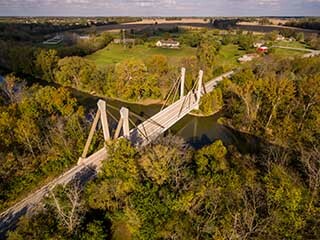 This project replaced the last remaining through truss in the county’s inventory with a modern, unique structure designed to fit in with the natural surroundings with minimal disruption to the environment. In order to avoid construction of substructure units within the limits of the channel, a cable stay suspension design was selected, providing a clear span length of 203 feet. Rising 86 feet above the stream elevation, the four main towers support the superstructure via 112 individual 1 3/8″ diameter 150 ksi bar stays. The back stays are anchored into bedrock with caissons and high strength rock anchors extending twenty feet into bedrock. 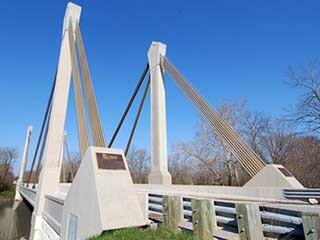 The bridge superstructure is comprised of precast, post-tensioned main girders, with precast, pre-stressed, post-tensioned box beam floor beams, and precast, pre-stressed deck panels with a composite cast-in-place deck. 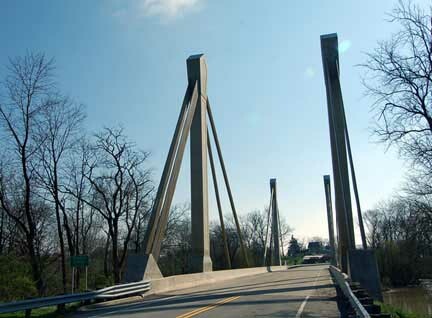 In addition, the contract called for the disassembly, transportation, and re-erection of the 1880’s era truss for a future bike path in the City of Westerville, Ohio. 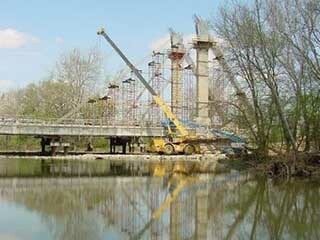 Winner, 2001 Ohio Contractors Association Move Ohio Award.